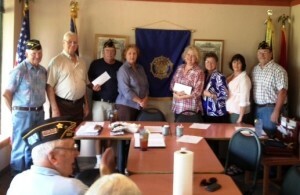 Generous Donations…American Legion Post 333 distributed donations to local civic organizations at their monthly meeting on Sep 8, 2014. Pictured left to right is Lee Johnson, Vice Commander; Louis Freeman, Outreach in the Hills; Al Halldorsen, for Hippe Recycle Center; Marilyn Robertson, Log Cabin Museum; Pam Cullum, Dove House; Mary Philips, Care Caps; Alice Chambers, FFBay Library; and Rick Pierce, Commander. Others receiving donations but not present were Boy Scout Troop 401; Shirley Softball/Baseball; and City of Shirley Homecoming.